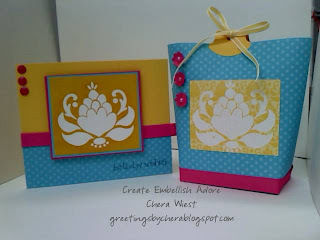 Create Embellish Adore: 2 Challenge Sunday.. 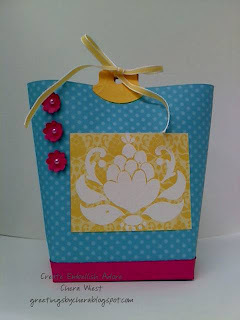 I made this little tote bag with it, since my theme this week was of birthday combos, I just kept going with it! I used two challenges to get this all put together. 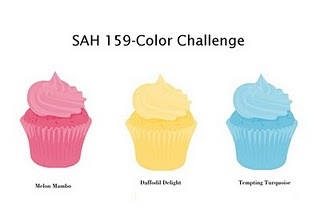 First was the colors from Stampoholics, which are a great bunch of ladies, and stampers too! Then I travelled over the Stamping 411 for the sketch, again a great bunch of stamping ladies! This will be short since the wind has kicked up and I am afraid power might go! Thanks for stopping by! Hug the ones you love! Thank you for playing with the Stamp a Holics...Love the ensemble...Hope you play again! WOW, love the embossed/brayer technique on this image!! And, your perfect little bag to match! Awesome and so bright and cheerful! The embossing and brayering does make it pop! 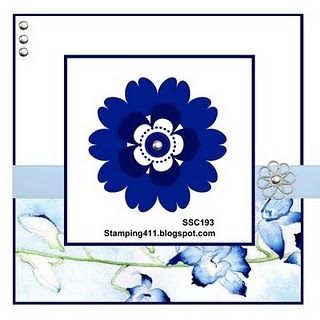 Thank you so much for joining the Stampaholics this week. Beautiful use of the brayer. It does make it pop. I'll say it pops! It's fabulous! Great looking card & bag - love those bright colors!! Thanks. Love the combo!! And those colors are awesome!! you totally rocked this out! thank you for playing with us at stampaholic! Gorgeous!!! 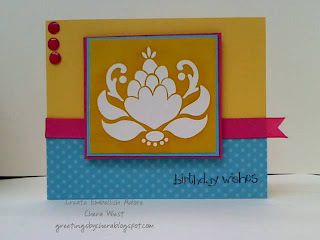 I love how that flower pops with the resist technique!